Here are recent reviews that have earned us a top rating by AVVO and accolades from estate planning Clients and peers. “My husband & I have sought Michael’s learned advice on a number of legal matters. Not only is he well versed in the law, but also a very professional, compassionate & caring person.” – Beth M.
“Michael prepared my parent’s trust and will documents. He was extremely professional and accommodating. Great communication throughout the entire process! 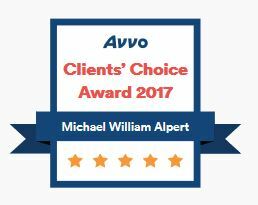 Highly recommend Michael!” – Ojala G.
“Michael Alpert is the greatest attorney I have ever worked with! He is very professional and always answers any questions I may have right away, in my many experiences working with Mike I have had nothing but great results! Highly recommended! !” – Dana C.
“Mr. Michael W. Alpert was very patient in explain the law and regulations of my situation. Also he is very capable and intelligent in find a solution for the most complex and challenge problems with the law.” – Jose M.
The Best! – Does What A Lawyer is Supposed to do. “Mike was very easy to speak with and specific and forthcoming with his advice, It was a very useful and practical discussion.” – Robert G.
“Michael has taken my case several times I can honestly say his amazing at what he does.” – Esther B.